When you are choosing the floor for your home, you need to make the decision wisely. Each room has specific needs that require special consideration for the type of flooring to install. 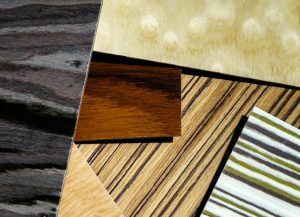 If you are looking for new flooring for rooms in your home, the choices can become overwhelming. Here are some tips that will guide you in the right direction on how to choose the right type of flooring for any room in your home. The kitchen is likely the most used room in your home. Not only do you use it on a daily basis to prepare meals for the family, but it is also often a gathering space for large groups of people. Since the kitchen is so busy, it needs to have flooring that is durable, can stand up to lots of use, and is easy to clean. Linoleum is inexpensive and easy to clean. It also comes in a variety of designs. However, the designs can often go out of style and can make your kitchen look outdated. Ceramic is another great option for the kitchen. The tiles are easy to maintain and come in a variety of shapes, sizes, and colors to meet the tastes of every homeowner. 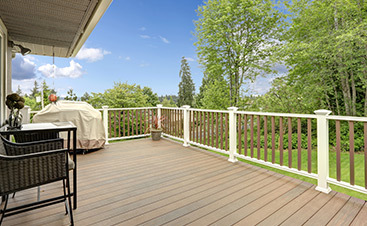 They are durable and can stand up to a fair amount of abuse without denting like linoleum can. Considerations to keep in mind when choosing ceramic tiles are that they can crack and are also slippery when they are wet. 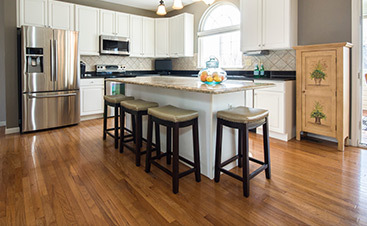 Wood floors can give a kitchen a homey feeling, which is particularly desirable for a common gathering space. Wood can also stand up to the heavy volume of use that kitchens are known to get. If you decide on installing wood floors in your kitchen, be sure to apply a good protective finish to guard against the moisture that can end up on the kitchen floor. The largest consideration when choosing a floor for the bathroom is moisture. Whichever floor you choose must be able to stand up to large amounts of exposure to water and moisture without being harmed. Textured ceramic tiles will hold up well against exposure to moisture. These tiles are also easy to work with and can be laid without much difficulty. However, ceramic tile can get pricey, depending on the size of your bathroom. Glass floor tiles have been becoming increasingly popular. They are aesthetically beautiful and can add warmth and comfort to your lavatory. Wood is no longer a no-no in the bathroom. However, if you choose to put wood flooring down, you must be vigilant in its care. You will need to consider the extra coats of protective sealer, and you will most likely need to refinish and reseal the floor regularly. These materials are great for bathrooms. First, they are green choices, as they are sustainable and naturally replenish themselves in the wild every few years. They look like traditional wood floors but are naturally resistant to mold, mildew, and bacteria, which makes them ideal for a bathroom. The flooring you choose for your main living space should be based mostly on personal preference. You spend lots of time in this area of the house, and you want it to be appealing to you as well as your guests. Ceramic tiles are beautiful and can add visual interest to a room. You can easily find ceramic tiles that are simple as well as those that are exotic and visually interesting. 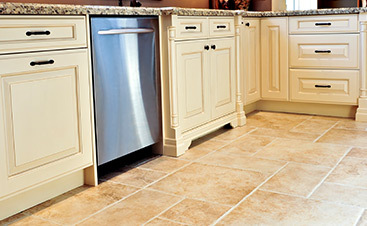 However, ceramic can be cold and hard underfoot. Wood flooring is naturally beautiful and elegant. It creates a warm feeling in any room in which it is laid. Wood flooring is also good for your feet and back. So, if you have trouble with those body parts, it’s an ideal choice. Wood floors are also stain-resistant and easy to clean. Wood floors offer versatility, as they can be sanded and refinished whenever you feel like a change. Carpet is a popular choice for living areas. It offers warmth and comfort. It also muffles sound, which is ideal for families who make a lot of noise. Carpet is available in many different colors and styles, so it is easy to find something that fits into any decor. Choosing the right flooring for each room in your home is essential to its ease in functioning as well as the overall appearance of it. If you need assistance choosing the right floors for your home, we can help you. Our technicians have years of experience and expertise that they can use to point you in the right direction.